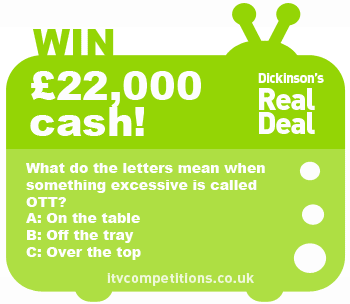 Dickinson's Real Deal competition win cash: £22,000 (28 Jan - 1st Feb) Big cash prize!!! Dickinson’s Real Deal competition win cash: £22,000 (28 Jan – 1st Feb) Big cash prize!!! Which of these is New York City popularly known as? You can enter the Dickinson’s Real Deal competition 3 times per phone number via itv.com competitions. Entry is free, unlike sms and phone calls which are +£1.50 each. This Real Deal competition runs all week and it’s a massive cash prize for the winner! NOTE: it looks like the itv.com online entry page is sometimes getting a bit overloaded…if you’re getting a “service unavailable” we recommend you wait a little while & try again!